Because they are so incredibly versatile navy blazers are one of our favorite wardrobe pieces. They’re equally appropriate for social events and business-casual days. To create a dressy look, pair your blazer with tan, olive, or gray trousers. A range of gray tones, from silver to charcoal or tan trousers can likewise work in several shades, from beige to tobacco. To create a less formal-but still stylish-look, wear your blazer with dark jeans and a crisp white shirt; skip the tie and unbutton your collar. When designing your custom navy blazer, select traditional brass buttons, or choose more contemporary horn buttons. Even though you’re building the blazer in a traditional navy color, the fabric doesn’t have to be boring. 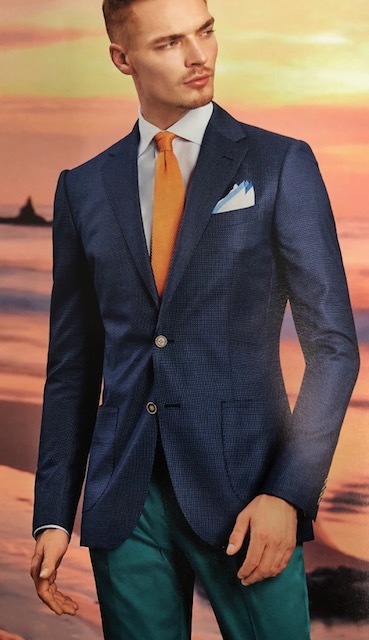 You can easily customize your blazer by selecting a fabric with rich texture, then add a stripe lining, and functional sleeve buttonholes for just the right touch of flair. This attention to design detail will create a one-of-a-kind blazer that will set you apart every time you wear it. A navy and a complimentary black blazer are great companion wardrobe pieces, because you can wear the same trouser colors with each coat. These two blazers double your mix-and-match potential, and should be part of every stylish gentleman’s wardrobe.